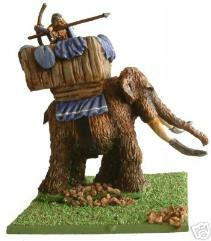 There are few units more effective or awe-inspiring in Mighty Armies than the Barbarian War Mammoth. Whether advancing alone or as part of a supporting group, you will find this unit almost unstoppable as it ploughs into enemy ranks, crushing everything under its path. Brave Mammoth tamers ride high in the beasts howdah, directing its attacks as they hurl spears and arrows down on the heads of their foes.